Parts of this country house date back as far as the 1600‘s, although it’s likely that there will have been buildings on the site even before then. It seems that Elizabeth Fletcher was well connected. In addition to the Wordsworths, Charles Dickens - a close friend of her son - was another regular visitor to the house. Following Elizabeth’s death, her daughter and son-in-law, Sir John Richardson, resided at the house. During that time Lancrigg welcomed such figures as Robbie Burns. 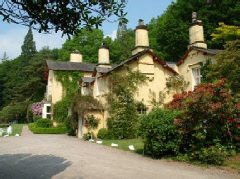 Today, the building is a country house hotel specialising in vegetarian cuisine.